What is a Wading Jacket? While waders are sure to protect your lower half from the extreme elements, what does one do to stay warm and protect their upper half when the weather gets extreme? A wading jacket, of course. With a whole market niche dedicated to jackets catering to the outdoor enthusiast in waders, these jackets feature certain designs and features that also cater to such. If you are an angler, hunter, or outdoor enthusiast who spends time in waders in harsh weather conditions, a proper wading jacket will likely be a necessity for you. So what makes one applicable to your needs? Let's delve into it a little deeper to help you make this decision. For those that spend much of their time wading to access their fishing spot, there is often more protection required than just a pair of waders. Oftentimes, conditions may be cold, wet, and windy. To combat the water and weather, a wading jacket worn on the upper half may be the difference between a miserable day fishing and one of the best days you have had in a long while. It's worn on the upper half allows for shell-like resistance in harsh weather conditions. Most have a multi-layer fabric construction that allows for water and wind resistance while still allowing for breathability. Wearing a properly selected wading jacket is sure to enhance your fishing experience. Between keeping you dry and comfortable and possessing features to make it a convenient tool for fishing, there is a lot to be gained. With that said, a low-performing, featureless model in harsh fishing conditions may be more of a burden than a benefit. There are certainly a lot of pros to having one of these. There are also a few cons that should be taken into consideration. However, many of these cons can quickly become pros when you spend the time to research. So choose wisely and the time you spend fishing will be that much more enjoyable. Keeps You Comfortable and Dry - A properly constructed wading jacket’s key role is to keep you comfortable and dry. Not only does this mean keeping you warm with proper insulation and wind resistance, but breathability to keep you cool when your activity level may be elevated. Pockets to Organize Gear - A good wading jacket serves an additional purpose of storing gear, tools, and accessories. With the right option, you shouldn’t have to wear a fishing vest or pack on top of it. Many are designed with a fishing vest pocket style to serve this purpose. Inhibits Movement and Casting Ability - Wearing any extra layers when trying to cast or move can come with some movement restrictions. Particularly for fly-anglers, maintaining freedom of movement is key. While a bottom-end or improperly fitting jacket will be a hindrance, a well-constructed and properly fitted jacket should present limited restrictions to movement and casting. Can Absorb Water - Lower-end options are often constructed with sub-par materials. In a wading jacket, I avoid those that are constructed with water absorbing materials such as cotton or fleece in key areas. Key areas that are subject to water-logging may be arms or the lower portions of the jacket. A fleece-lined hand warmer pocket is a much-appreciated addition though. While there is quite a bit of variability on the market, for serious fishermen, there are a few features most are looking for in a high-performance wading jacket. On top of keeping you warm and dry on the water, it should also serve other purposes. A top-of-the-line model will possess certain features to make it even more comfortable and convenient for dedicated anglers and outdoor enthusiasts. Here are some features you should consider when deciding on a wading jacket to fit your needs. Breathability is a key component to the comfort level of a wading jacket that may be worn all day long. When purchasing fishing waders, this is the exact feature I am looking for to remain comfortable in variable conditions. There are a variety of high-tech breathable, yet waterproof, materials on the market and each company may have its own proprietary name. The way these fabrics function is that they have precisely-sized microscopic pores. These pores are sized so that water molecules are too large to pass through, making them waterproof. However, the holes are just large enough so that water vapor (i.e. evaporated sweat) molecules can pass through. This keeps the inside of the jacket from getting clammy. Waterproof jackets are often favored when looking to purchase the product for wading. 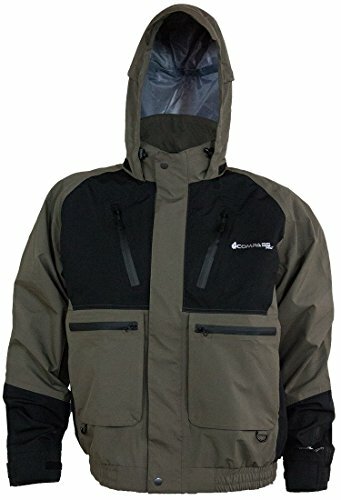 Seeing that you will likely be standing waist deep in water, getting splashed on, rained on, etc., you will certainly appreciate having a jacket that can repel water effectively. Pockets are a very handy thing to have on a wading jacket. Quick access to certain items when you are waist deep in a river is an appreciated feature. For many people, a wading jacket is going to take the place of a fishing vest or chest pack. Some are designed with pockets and features that mimic those of a fishing vest. Tight cuffs, when fitted properly, can keep your arms warm and dry by keeping water from dripping down your arms when casting. Some can even keep water out when reaching into the water to release a fish. While not all jackets possess this feature, many will have a tight sealing wrist cuff to help with this. This is certainly a feature of top-of-the-line wading jackets and one you will likely appreciate on those cold days. Now that we've learned a little bit more about these wonderful jackets, let's see which ones made our list and why. Our vote for best all-around is the functional, yet affordable, Tekk Toad Wading Jacket from Frogg Toggs. Constructed from the classic, yet reliable, Frogg Toggs material that has fully sealed seams and breathable DriPore technology. This jacket gives users complete waterproof and breathable performance on a budget. The jacket boasts a full-cut/swing back design to allow for movement and casting comfort. Along with that, the adjustable storm hood allows users to cinch down to protect against the weather or open it up on milder occasions. The neoprene sleeve cuffs assist in keeping water from dripping down your arms. This jacket features two sets of zippered hand-warmer pockets. One set down low for optimal comfort position, and another set above the high-water mark so you can warm cold hands even when waist deep in a cold, running river. Two additional chest storage pockets keep necessary items close at hand and protected from the elements. This is our top all-around wading jacket pick due to its great performance on a budget. Frogg Toggs has built a reliable brand in waterproof materials with their proprietary Dri-Pore technology. Though this jacket lacks the fancy features of more dedicated and high-end fishing options, it outperforms many others on the market. Its affordable price makes it hard to beat this simple no-frill wading jacket that will keep you protected from the elements when you are out on the water. 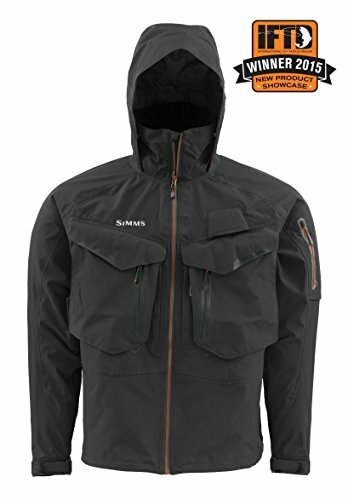 For those looking for a fully-featured, top-of-the-line wading jacket, Simms has you covered once again. If the budget isn’t so much an option and performance, features, and convenience come first; the G4 Pro Jacket is the newest evolution of Simms Wading Jacket series and will certainly not disappoint. The shell is made out of the well-known and reliable lightweight Gore-Tex Pro-Shell breathable and waterproof fabric that has been updated to increase abrasion and tear resistance. The water-resistant zipper is another great feature that is appreciated on this jacket. The jacket features nine convenient storage pockets. These include two zippered chest pockets, two line-tippet pockets, two bellowed chest pockets, a single sleeve pocket, a single internal pocket, and finally, a large back storage pocket for bulkier items. With this much storage designed for anglers in mind, you can consider leaving your fly vest in the truck. The storm hood on this jacket is adjustable for varying conditions and can even be stored away in a zippered compartment to keep it out of the way. One of the greatest features, in my opinion, is the highly water-resistant Dry-Cuff technology. Tight sealing and adjustable, these cuffs are even capable of keeping your arm dry when reaching in the water to handle fish. Simms is the most trusted brand in fishing apparel for fisheries and guiding professionals all over and it is easy to see why. Their reliable products, matched with unsurpassed durability and leading-edge technology. The G4 Pro is a supreme example of the quality products Simms is so known for. WiIth ultimate protection from the elements and features with anglers in mind, the G4 Pro is likely one of the best on the market. If your budget is a little loose and you want the best, look to Simms for your wading jacket purchase. 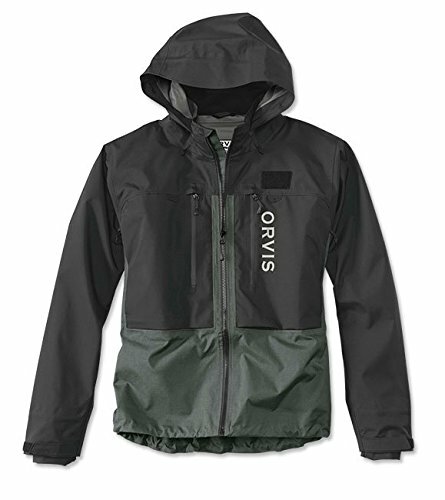 For those fly fishing anglers looking to get a dedicated wading jacket to protect them while practicing their art, be sure to check out the Orvis Pro. 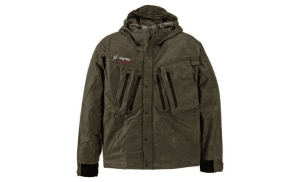 Orvis, a reputable and dedicated fly fishing brand, has designed this wading jacket specifically with the fly fishing angler in mind. This guide-class jacket is built to handle the most rugged conditions with innovation in design and convenience, placing this jacket ahead of others in its category. The jacket features a waterproof, breathable three-layer design to keep you protected and comfortable within. The fully taped seams and water-resistant zippers assist in keeping the elements at bay. For extra comfort, there are suede linings on both the chin guard and hand-warmer pockets. Speaking of pockets, in addition to the two large front storage pockets, the jacket features an inner storage pocket to really protect certain items. For fly-anglers, there is an integrated fly patch, D-ring net attachment, and rubberized tabs for tool docking. This jacket also features a “Dolphin Skin” cuff system that is designed to seal tightly around your wrists and prevent water from entering your sleeves. Last, but certainly not least, this specific jacket features water-resistant side zips. These serve two purposes: increasing ventilation on warm days and allowing easier access to your waders or clothing below your wading jacket. Orvis is one of the more reputable names in the fly-fishing industry and is known for cutting-edge gear. This wading jacket certainly follows suit and is a top-of-the-line jacket used by guiding professionals. Featuring all the protections, comforts, and conveniences any high-quality wading jacket should have, the Orvis Pro is sure to deliver all that a fly angler needs in ever-changing conditions. The spectrum of wading jackets spans many different features, qualities, and more importantly, prices. If spending multiple hundreds of dollars seems slightly excessive to you, we have another budget pick for you. Another sub-$100 jacket, the Compass 360 HydroTEK Thunder Jacket, will keep you shielded from the elements on even the long days out on the water. Like any good wading jacket, it is completely waterproof and breathable throughout, thanks to HydroPore 1.5 technology. For convenience, the jacket features four separate front storage pockets protected by water-resistant zippers. An adjustable storm hood protects you from rain and wind and then stores away in a stow-away pocket to keep it out of the way when not needed. If you are looking for a simple, no-frills jacket to cut the edge of harsh elements without breaking the bank, be sure to consider this one. While it may not have all the cutting edge features, comforts, and conveniences of higher end wading jackets, for the price, this jacket offers exceptional value. While most may associate wading jackets with fishing applications, there are several other outdoor sports that require the use of a wading jacket. For waterfowl hunters, spending time waist-deep in frigid water in sub-freezing conditions is a way of life. As such, more protection is needed beyond insulated neoprene waders. A jacket is obviously going to be a necessity in these conditions and the Avery Heritage Collection wading jacket serves the purpose of offering extreme protection and retaining a classic feel. Different than the new-age technical waterproof jackets, this jacket by Avery maintains waterproof and windproof protection with heavy-duty, waxed cotton cloth. While not breathable like new-age materials, waxed cotton is a time-tested, durable material in harsh conditions often encountered in waterfowl hunting scenarios. This jacket features a removable hood for protection when the weather gets rough. Lined hand-warmer pockets are placed high on the chest for those times you may be getting into deeper water. Side pockets are bellowed for extra room and feature shell loops for quick reloading times. Other features include an additional zippered chest pouch and zippered cuff openings to layer thick gloves underneath. Let me start off by saying that my personal waterfowl hunting coat is a similar waxed cotton design. It invokes a certain sense of heritage, wearing similar attire waterfowl hunters wore in the days of yore. Durable, weather-resistant, and long-lasting, waxed cotton attire certainly has its place in today's age and waterfowl hunting is one of those places. While much different than other technical wading jackets in this review, this jacket by Avery fills a certain niche appreciated by waterfowl hunters all over. For those spending long hours in waders in ever-changing weather conditions, a proper jacket to pair with their waders is a necessity. 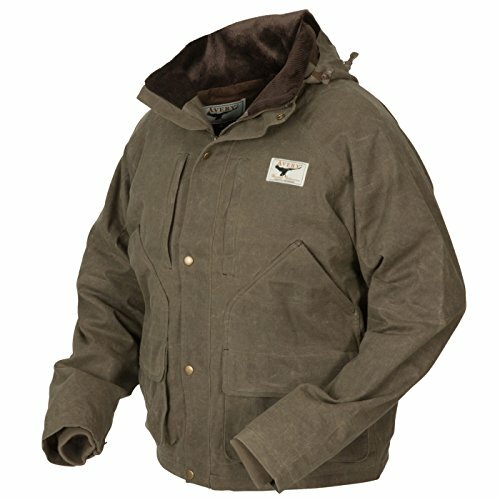 Wading jackets are designed to be worn in conjunction with waders and many are specialized for certain outdoor applications, such as fishing or hunting. Take into consideration the type of weather you may be exposed to, the types of comforts and conveniences you desire, and your budget range to help determine the best jacket for your style. With a wide breadth of jackets covered in this review, you should have no problem nailing down a selection to fit your specifications.